Monday, October 29, 7:30-9:30 pm: Join the House of France for the play Terres des Hommes by Antoine de Saint Exupéry at the University of San Diego. André Nerman will direct the play. We have 10 tickets to give to the cottage members. Contact Marion to request a ticket. 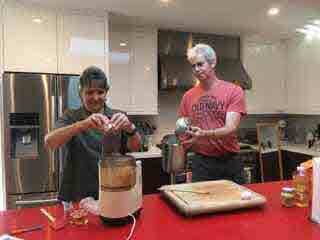 November: Onion soup preparation and Thanksgiving dinner. Dates to be determined by Michele and Mireille. December 7-8: December Nights. Plan to come volunteer. January–February. Look for sampling of a galette des rois, a restaurant dinner to thank the December Nights volunteers, a visit to Bread and Cie, cheese tasting at Venissimo, French cinema at the San Diego Jewish Film Festival. Lundi 29 octobre, 1930-2130: Rejoignez la Maison de la France pour la pièce Terres des Hommes d’Antoine de Saint Exupéry à l’Université de San Diego, dirigée par André Nerman. Nous avons 10 billets à donner aux membres du Cottage. Contactez Marion pour lui demander un billet. novembre: préparation de soupe à l’oignon et dîner de Thanksgiving. Les dates seront décidées par Michele et Mireille. 7-8 décembre: December Nights. Venez vous porter volontaires. janvier–février. Préparez-vous pour la galette des rois, un dîner au restaurant pour remercier les volontaires de December Nights, une visite de Bread and Cie, une dégustation de fromages à Venissimo, et du cinéma français au Festival du film juif de San Diego. L’AATF (American Association of Teachers of French) de San Diego together with les Services Culturels de l’Ambassade de France aux États-Unis et l’Alliance Française de San Diego will organize a workshop for French teachers on Saturday, October 27, from 3-6 pm at the Alliance Française. Register here. For commercial activities, you might want to contact the San Diego French-American Chamber of Commerce, which supports businesses that connect France and San Diego, and offers shared incubator office space through OuiStart (also the office space for the Honorary Consul of France). The House of France is open the first two Saturdays and Sundays of the month for a 5-hour period between 11:00 am and 4:00 p.m. and the fourth Tuesday of the month from 11:00 a.m. to 3:00p.m. The slightly flexible 5-hour time window started in fall 2017, and seems to be working well, so the House of Pacific Relations will continue with this schedule in 2019. Food can be served on Saturday and Sunday and it must meet Health Department requirements, which means that individually packaged cookies or pastry can be served. Food must be covered (i.e. in a display box). Members of the public cannot simply help themselves; hosts must serve food with a napkin or tongs. Children cannot be served unless their parents are present. Signs can say “donations” but cannot suggest an amount. We have said we will offer cookies (madeleines, palmiers) and bread, and we have been working to identify the best source of individually packaged madeleines. The city reminds hosts to avoid expressing political opinions or using inappropriate language. or contact Roselyne G. fullyfrench@gmail.com or Chris Perry crestline43@verizon.net. All of us need to take responsibility for opening the French Cottage at least once per year. During the academic year, undergraduate French students from the University of San Diego, are available to help the volunteers who open the cottage. Food can be sold twice a year. Our next official food sales will be during the Ethnic Food Fair on Memorial Day Weekend on May 26, and we also have expanded food options available for a donation during our lawn program on July 14. Those who will be available to help with food sales are reminded to keep your food handler certification up-to-date. The first Saturday of every month, join Roselyne at the French Cottage during regular hours (noon-5 pm) for conversation and games in French. Practice your French, and share a moment of conviviality. Speakers of all levels welcome! The long-awaited House of France Tijuana excursion took place on Saturday March 17th. 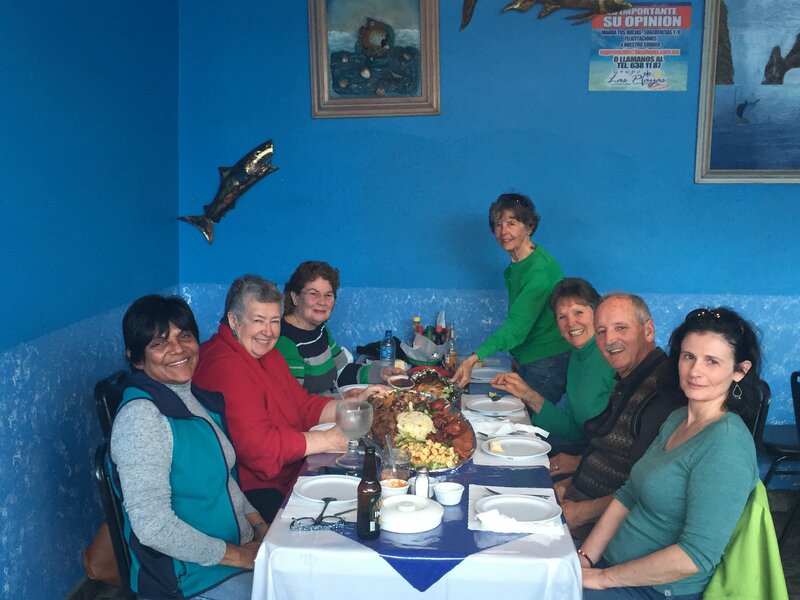 The group had lunch at a fish restaurant, enjoying delicious dishes with fish, octopus, shrimp, and oysters. This was followed by a visit to the border wall (where it extends into the ocean), to lovely neighborhoods of Tijuana, to the restaurant that invented Caesar Salad, and finally to “Le Petit Prince” French pastry shop for dessert. The proprietor, Zak, is Moroccan and worked at the Hotel Del, before deciding to launch his own business. Many thanks to our local guide, Evelyne. Since its creation, the Breizh Amerika Collective has travelled to NYC, Chicago, Detroit, St Louis, Cleveland, Rochester, Santa Fe, Albuquerque, New Orleans, Baton Rouge, Lafayette, Arnaudville and Scott, Louisiana to celebrate la Fête de la Bretagne. Find the event on Facebook and spread the word!https://www.facebook.com/events/2108887679368585/Ethnic Food Fair, Sunday May 27th, 11 am-5 pm. The House of France will again sell pastries. Volunteers much appreciated. After a strenuous tasting session, the board has selected Arely French Bakery Café, located in Clairemont, as our pastry supplier this time. Fête de la Musique, Thursday June 21st, on the lawn in front of the cottage. Joint the French Summer solstice tradition with an evening of outdoor music. Lawn Program, Sunday July 14th. We celebrate Bastille Day with an hour of music and entertainment on the lawn in front of the cottage. Your suggestions for performers would be most welcome. Haitian Bridge Alliance: $1000 to help meet immediate funding shortfalls in order to provide critical support for Haitian refugees in San Diego. We also hope to coordinate a clothing drive for refugee children. La Petite École: A donation to help provide furniture for the school’s new campus in Kearny Mesa. High School Student Scholarship: Two $500 scholarships to be offered. Roselyne will coordinate details. Beachtown au Lyceum Theater, le samedi 14 avril. Le San Diego Repertory Theatre nous a offert 10 billets gratuits pour leur première mondiale de la pièce Beachtown. Nous sommes encore en train de négocier les détails, mais nous avons demandé des billets pour le 14 avril, date où il y aura des spectacles à 14 h et 20 h. (Nous avons demandé 20 heures comme premier choix.) Les billets seront premier arrivé, premier servi. RSVP avant le 10 avril à Marion or Sarah si vous êtes intéressé, et faites-nous savoir de combien de billets vous avez besoin.Cooperative Open House, le samedi 21 avril. La Maison de la France et l’Alliance Française ouvriront le Cottage ensemble. Pour cette occasion spéciale, nous offrirons des échantillons de macarons, de crêpes et de madeleines. Il y aura aussi un photomaton amusant. (Les dons sont acceptés avec reconnaissance.) Passez dire bonjour à nos amis. Collecte pour les réfugiés haitiens, le samedi 12 mai au Hall of Nations à partir de 18 h (à confirmer). Aidez à soutenir la diaspora francophone. Dîner préparé par des membres de la communauté haïtienne. Payez ce que vous pouvez. (Un don de 25 $ par personne est suggéré.) RSVP à Marion avant le 7 mai. Nous allons aussi recueillir des vêtements, des couches, des couvertures, etc. Nous sommes allés à un restaurant de poisson pour manger de délicieux plats composés de poisson, poulpes, pieuvres, crevettes et huîtres. Nous sommes ensuite allés voir le mur frontalier qui tombe dans l’océan, les beaux quartiers de TJ, le restaurant qui a inventé la sauce Caesar, puis avons pris le dessert dans une pâtisserie française “le petit prince”. Elle est tenue par Zak, un marocain tres sympa qui a travaillé auparavant a l’hôtel Del et decide de monter sa propre affaire. Un grand merci à notre guide hors pair Evelyne. Francophollies, le dimanche 20 mai. La réunion annuelle des organisations françaises à San Diego (“Déjeuner sur l’herbe”) commencera à midi à Kate Sessions Park. Apportez quelque chose à partager pour le pique-nique potluck, ainsi que vos propres chaises. Les tables, le linge de table et la glace seront fournis. Venez manger, faire la sieste, recontrer, jouer et découvrir. Pour faciliter l’organisation, veuillez-vous inscrire ici. Ethnic Food Fair, le dimanche 27 mai de 11h à 17 h. La Maison de la France vendra à nouveau des pâtisseries. Les volontaires sont les bienvenus. Après une séance de dégustation intense, le comité a choisi Arely French Bakery Café, situé à Clairemont, comme fournisseur de pâtisserie cette fois-ci. Fête de la Musique, le jeudi 21 juin, sur la pelouse devant le cottage. Faites partie de la tradition française du solstice d’été avec une soirée de musique en plein air. Lawn Program, le dimanche 15 juillet. Nous fêterons le 14 juillet avec une heure de musique sur la pelouse devant le cottage. Vos suggestions pour des artistes sont les bienvenues. Haitian Bridge Alliance: $1000 pour aider à combler les déficits immédiats de financement afin de fournir un soutien essentiel aux réfugiés haïtiens à San Diego. Nous espérons également coordonner une collecte de vêtements pour les enfants réfugiés. La Petite École: Un don pour aider à fournir des meubles pour le nouveau campus de l’école à Kearny Mesa. High School Student Scholarship: Deux bourses d’études de $500 seront offertes. Roselyne coordonnera les détails. Join OuiStart and network with like-minded entrepreneurs on Wednesday, April 4, 2018 from 8 am – 9 am. This monthly business breakfast is an opportunity to meet successful executives and foster your business relations. OuiStart, 8525 Gibbs Dr., Suite 304, San Diego, CA 92123. RSVP online. The French Film Club of San Diego will screen the documentary Visages Villages (Faces Places) on Friday, April 6, at 7:30 pm at the San Diego French-American School. 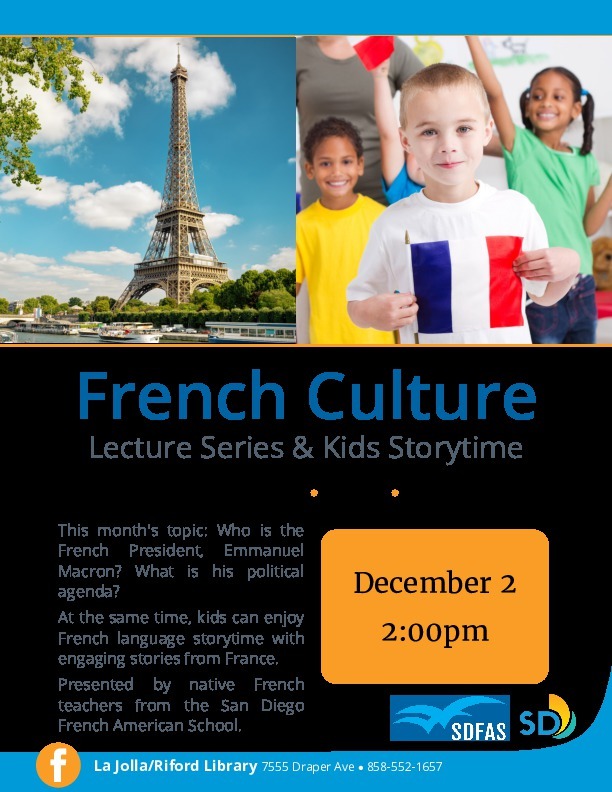 The Academy Award-nominated documentary is by Agnès Varda and JR.
Join teachers from the San Diego French-American School for French language storytime with engaging stories from France, as well as vocabulary building and community building. Free. For children of all ages. Saturdays at 2 pm. April 7 and May 5. Weekly lawn programs have started Sunday afternoons (and a few Saturdays) at 2 pm, through November. In April look for Scotland (Saturday, April 7), the “Queens” organization for young members (Sunday, April 8), England (Sunday, April 15), and Finland (Sunday, April 22). Teachers from the San Diego French-American School continue their monthly lecture series on Tuesday, April 10, at 6 pm at the La Jolla Riford Library, with a presentation on the immigration debate in France. “France continues to deal with waves of refugees from Syria and the Middle East—and many French citizens aren’t happy with what’s being done. How is France addressing the crisis? What does it mean for the world?” Light refreshments provided. The April lunch will be hosted by Germany at noon on Wednesday, April 11th. The House of Pacific Relations International Cottages Ladies Auxiliary Lunches are scheduled for the second Wednesday of the month, at noon in the Hall of Nations, price $5. For further information e-mail Brigitte Gilmore or contact her by phone: (858) 487-8402. All houses will be closed on Sunday, April 22, when Balboa Park will host the Earth Day Fair. French Cottage hosting coordinator, Roselyne Gadet, will offer half-day and full-day summer camps (July 2-6, July 9-13, and/or August 6-10). Discounted prices for House of France members. To order the House of Pacific Relations History Book, please contact Joachim Wolff, the HPR Treasurer, at 619 890 3040 or hprtreasurer@gmail.com. Pricing will depend on the number of orders. The House of France is open the first two Saturdays and Sundays of the month for a 5-hour period between 11:00 am and 5:00 p.m. and the fourth Tuesday of the month from 11:00 a.m. to 3:00p.m. The slightly flexible 5-hour time window started in fall 2017, and seems to be working well, so the House of Pacific Relations will continue with this schedule in 2019. Food can be served on Saturday and Sunday and it must meet Health Department requirements, which means that individually packaged cookies or pastry can be served. Food must be covered (i.e. in a display box). Members of the public cannot simply help themselves; hosts must serve food with a napkin or tongs. Children cannot be served unless their parents are present. Signs can say “donations” but cannot suggest an amount. We have said we will offer cookies (madeleines, palmiers) and bread, and we have been working to identify the best source of individually packaged madeleines.The city reminds hosts to avoid expressing political opinions or using inappropriate language. Food can be sold twice a year. Our next food sales will be for the Ethnic Food Fair on Memorial Day Weekend. Those who will be available to help with food sales are reminded to keep your food handler certification up-to-date. Hostess Chair/Membership Secretary: Roselyne GadetThe board members welcome your suggestions. Feel free to share your ideas. The December Nights Shuttles run on Friday from 3:00-midnight and on Saturday from 11:30 until midnight in all locations. The last shuttles depart for the Park at 8:30pm so plan to arrive at shuttle location BEFORE 7pm! The last shuttle from the park is at 11:45pm. City College Lots between 16th and “B and C” Streets: Parking is free and there are more than 1,500 parking spaces. Shuttle drops off at 6th & Laurel Streets. The Park is approximately 1/4 mile from City College, so walking is an option. To get to the City College lots use I-5 and exit at “B” Street. Downtown San Diego on Ash St between 5th and 6th Ave. Numerous parking lots in this area at $5, or free street parking after 6pm. Shuttle drops off at 6th and Laurel. ***NOTE*** There still will be NO Shuttle from Petco Park this year! If you’re planning to volunteer, make sure that Marion has you in the schedule. Contact her via e-mail or phone (619 743 8947) to let her know when and how long you can help. Also let her know if you have food server certification. Also please update your food server certification. According to the City of San Diego Health Inspector everyone who serves food must have a certificate on file. HOW TO UPDATE YOUR FOOD SERVER CERTIFICATION. If you’re anticipating volunteering at December Nights (and we hope you are), then please make sure that you have current food handler certification. Certification is good for 3 years and can be obtained through an on-line course. Here’s a link. The French Cottage will reimburse expenses for volunteers. Food handler certificates must be on file at the French Cottage. When you take the class, please send your a scan or electronic version of your certification to Chandra Bordes. Plan to stop by the French Cottage on Sunday, December 10th at 4 pm, toward the close of our regular hours, to help us welcome in the holiday season with a shared bûche de Noël. RSVP by December 6th to Marion. 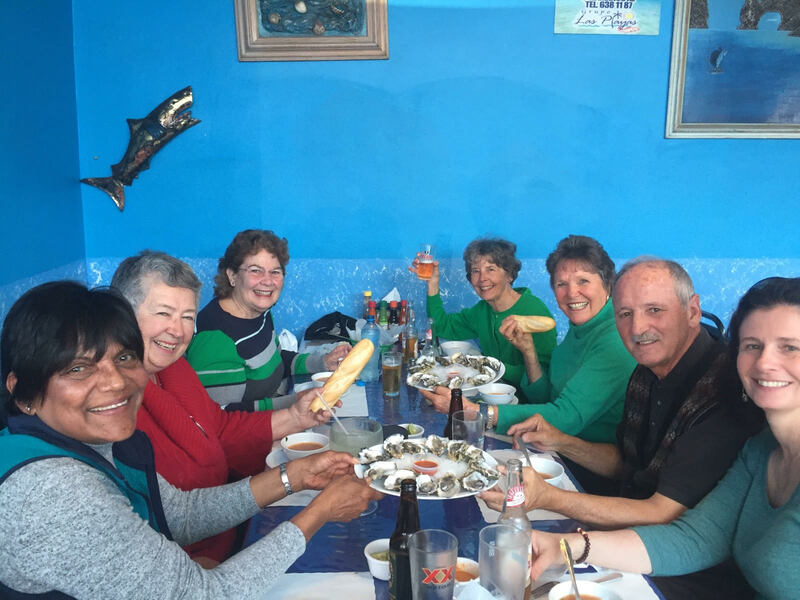 The Tijuana excursion originally anticipated for October has been delayed to January or February, when our Tijuana-based vice president, Evelyne Trolley de Prevaux, will help coordinate a cross-border adventure—a meal in Tijuana and an insider’s view of the city. Details still be be coordinated. We’ll plan to meet at the Old Town Park and Ride to carpool across the border. Please plan to bring your passport. Venez nous aider à nos stands le vendredi 1er et samedi 2 décembre pendant December Nights dans Balboa Park. Nous vendrons de la soupe à l’oignon, des crèpe des pâtisseries et des boissons à 3 endroits différents (dans le cottage, sous une tente et dans le beer garden). Si vous comptez aider, vérifiez que Marion vous a sur son programme. Contactez-la par e-mail ou par téléphone (619 743 8947) pour lui dire quand et pour combien de temps vous pouvez aider. Faites-lui aussi savoir si vous avez le certificat d’hygiène alimentaire. Veuilez aussi mettre à jour votre certificat d’hygiène alimentaire. Selon l’inspecteur sanitaire de la ville de San Diego, tous ceux qui servent de la nourriture doivent avoir un certificat enregistré par la municipalité.COMMENT METTRE À JOUR VOTRE CERTIFICAT D’HYGIÈNE ALIMENTAIRE. Si vous pensez aider pendant December Nights (et nous l’espérons bien), alors veuillez SVP vous assurer que votre certificat de service alimentaire est à jour. Le certificat est valide pendant 3 ans et peut être obtenu par un cours en ligne. Voici un lien. Le Cottage remboursera les frais des volontaires. Les certificats d’hygiène alimentaire doivent être enregistrés par le Cottage. Quand vous avez fini le cours, vueillez envoyer un scan ou une verson électronique de votre certificat à Chandra Bordes. Pensez passer au French Cottage le dimanche 10 décembre à 16h, vers la fin de nos heures normales, pour partager de la bûche de Noël. RSVP avant le 6 décembre à Marion Lanier. L’excursion à Tijuana prévue pour le 14 octobre a été repoussée au mois de janvier et février. Notre vice présidente Evelyne Trolley de Prevaux, installée à Tijaunaa, pour une aventure transfrontaliére: un repas à Tijuana and une vue d’initié de la ville. Les détails restent à coordonner. Nous nous rencontrerons au Old Town Park and Ride pour traverser la frontière en groupe. Apportez vos passeports. The House of Peru will be organizing an informal candlelight vigil on Monday, December 4 at 4:30pm in the open grass area in Balboa Park at the corner of Park Blvd and Presidents Way. All of you are invited to attend. Contact Oscar Urteaga for more details. Jennifer Morton Riggs e-mailed with information about her Kickstarter project for a French Conversation Starter Pin. The antique silver/enamel pin is designed to connect people as they wait for coffee, eat lunch, wait for a bus, etc. Two people standing in line waiting for coffee would not know they both speak (or are learning) French so the French Conversation Starter Pin announces this with “Je voudrais pratiquer le français”. This can spark a conversation that offers extra practice and a chance to meet a great person over the shared love of French. Find her project on Facebook or Kickstarter. The House of France is open the first two Saturdays and Sundays of the month for a 5-hour period between 11:00 am and 5:00 p.m. and the fourth Tuesday of the month from 11:00 a.m. to 3:00p.m. Saturday openings are new this year, at the request of the City of San Diego, so this means we need more volunteers. The slightly flexible 5-hour time window is new, and we’ll send updates if that changes again. or contact Roselyne G. fullyfrench@gmail.com or Isabelle F. (858) 404-0755 isalfsd@gmail.com. For fall 2017, volunteers are needed for the following date: November 12. Even for dates with identified volunteers, additional helpers would be much appreciated for most opening dates. Food can be sold twice a year. Our next food sales will be for December Nights (Friday December 1 and Saturday December 2). Let Marion know by e-mail or phone (619 743 8947) when and how long you can help, and let her know if you have food server certification. Also please update your food server certification. According to the City of San Diego Health Inspector everyone who serves food must have a certificate on file. Thank you for coming to our Thanksgiving dinner on November 11th. Thanks to Michele Trevino for hosting, and thanks to all of the chefs and potluck contributors for a delicious feast. Congratulations to Shirley and Chris for joining the board, a big thank you to Evelyne and Isabelle for their help last year, and welcome to our new members. 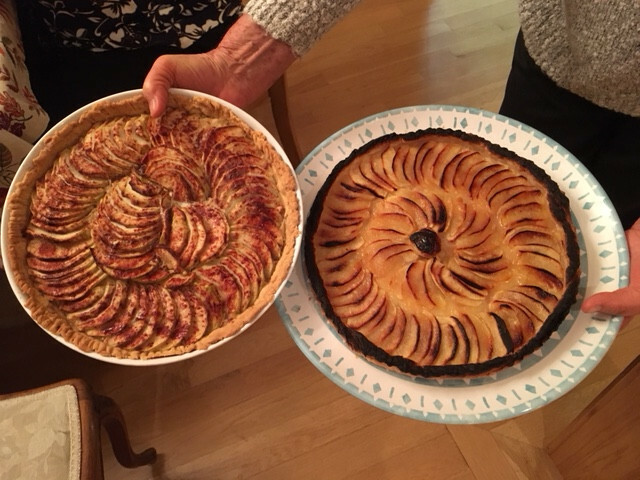 Two wonderful homemade tarts for the Thanksgiving feast! Faites savoir à Marion par e-mail ou par téléphone (619 743 8947) quand et pour combien de temps vous pouvez aider, et dites-lui si vous avez le certificat d’hygiène alimentaire. Veuilez aussi mettre à jour votre certificat d’hygiène alimentaire. Selon l’inspecteur de la ville de San Diego Health, tous ceux qui servent de la nourriture doivent avoir un certificat enregistré par la municipalité. COMMENT METTRE À JOUR VOTRE CERTIFICAT D’HYGIÈNE ALIMENTAIRE. Si vous pensez aider pendant December Nights (et nous l’espérons bien), alors veuillez SVP vous assurer que votre certificat de service alimentaire est à jour. Le certificat est valide pendant 3 and et peut être obtenu par un cours en ligne. Voici un lien. Le Cottage remboursera les frais des volontaires. Les certificats d’hygiène alimentaire doivent être enregistrés par le Cottage. Quand vous suivez le cours, vueillez envoyer un scan ou une verson électronique de votre certificat à Chandra Bordes. L’équipe française de surf handi espère recueiller suffisement de fonds pour revenir à La Jolla pour une autre année de compétition internationale au Stance International Surfing Competition World Adaptive Surf Championship. Vous pouvez contribuer à leur campagne. Si l’équipe vient, nous comptons rejoindre ses membres pour un petit déjeuner/brunch à La Jolla Shores le dernier jour de la compétition le dimanche 3 décembre. Merci d’étre venus à notre dîner de Thanksgiving, le 11 novembre. Merci à Michele Trevino de nous avoir accueilli, et à tous les chefs et ceux qui ont contribué un plat à un festin délicieux. Félicitations à Shirley et à Chris qui ont rejoint le comité, un grand merci à Evelyne et à Isabelle pour leur aide l’année dernière, et bienvenue à nos nouvauex membres. Deux merveilleuses tartes faites maison pour le repas de Thanksgiving! Sadly the Red Card Café has folded, leaving us without a location to host our Beaujolais Nouveau tasting. We’ve had to cancel the event (though not before trying to find a replacement option.) Apologies to everyone who hoped to attend. Join us to celebrate the season, Saturday November 11th starting at 4:30 pm, at the Trevino’s house (4225 Ridgeway, San Diego 92116). The French Cottage will provide the turkey, wine, bread and dessert. Please bring a side dish to share. This event also serves as our annual board elections. We’re looking for new volunteers. RSVP by November 8th to Marion Lanier. On Saturday, October 7, the House of France hosted 15 teenage Syrian refugees who attended the Maker Faire and then stopped by the cottage for snacks. We had pastries generously donated by Michel Malecot, at the French Gourmet, madeleines, palmiers and Orangina. The kids also enjoyed making their own cheese flowers with the cheese curler! Thank you to Shirley for leading the effort. We’re still in need of volunteers for Sunday, November 12th. Please see below for the open dates, and sign to host up via the SignUpGenius web link or by e-mailing Roselyne (fullyfrench@gmail.com) and/or Isabelle (isalf@earthlink.net). Plan to volunteer in our food stands Friday December 1 and Saturday December 2 for December Nights in Balboa Park. We’ll have onion soup, crèpes, pastries, and libations on offer. This is our biggest fund raising event of the year, and as always, we’ll need lots of volunteers for Friday and Saturday, and also for set up and clean up. Let Marion know when and how long you can help. Update your food server certification. If you’re anticipating volunteering at December Nights (and we hope you are), then please make sure that you have current food handler certification. Certification is good for 3 years and can be obtained through an on-line course. Here’s a link. The French Cottage will reimburse expenses for volunteers. The HPR will also run a course closer to date of December Nights. Change of plan for Tijuana excursion. Malheureusement le Red Card Cafe a fermé, et donc nous ne pouvons pas accueillir notre dégustation de Beaujolais Nouveau. Nous avons dû annuler la dégustation (après avoir essayé néanmoins de trouver un remplacement). Toutes nos excuses à ceux qui espéraient participer. Rejoignez-nous pour fêter Thanksgiving, le samedi 11 novembre à partir de 16h30, à la maison Trevino (4225 Ridgeway, San Diego 92116). La maison de la France fournira la dinde, le vin, le pain et le dessert. Veuillez apporter un autre plat à partager. Nous conduirons en même temps les élections annuelles du comité. RSVP avant le 8 novembre à Marion Lanier. Le samedi 7 octobre, la Maison de la France a accueilli 15 jeunes réfugiés syriens qui ont assisté au Maker Faire et qui sont ensuite venus au Cottage pour goûter. Nous avons eu des pâtisseries généreusement offertes par Michel Malecot du French Gourmet, des madeleines, des palmiers et de l’Orangina. Les enfants se sont aussi amusés en faisant des fleurs en fromage. Merci à Shirley d’avoir dirigé cet activité. Nous avons toujours besoin de volontaires pour ouvrir le cottage le dimanche 12 novembre. Veuillez-voir ci-dessous et vous inscrire au lien SignUpGenius ou en envoyant un message à Roselyne (fullyfrench@gmail.com) et/out à Isabelle (isalf@earthlink.net). Prévoyez de nous aider à nos stands de nourriture le vendredi 1er et samedi 2 décembre pendant December Nights à Balboa Park. Nous vendrons de la soupe à l’oignon, des crèpes, des pâtisseries et des boissons. C’est notre plus grande venue annuelle, et comme toujours nous aurons besoin de beaucoup de volontaires vendredi et samedi, ainsi que pour la mise en place et le nettoyage. RSVP à Marion Lanier. Mettez à jour votre certificat de service alimentaire. Si vous pensez aider pendant December Nights (et nous l’espérons bien), alors veuillez SVP vous assurer que votre certificat de service alimentaire est à jour. Le certificat est valide pendant 3 and et peut être obtenu par un cours en ligne. Voici un lien. Le Cottage remboursera les frais des volontaires. La HPR organisera aussi un cours plus près de la date de December Nights. Excursion à Tijuana repoussée à janvier ou février. A Balboa Park walk with a docent will be held on Nov. 7 at 4:00 PM. All House of Pacific Relations members (i.e. members of all houses) are welcome. Meet at the House of Hospitality. These walks provide information about the past and about the future plans for the park. The November lunch will be at noon on Wednesday, November 8th. 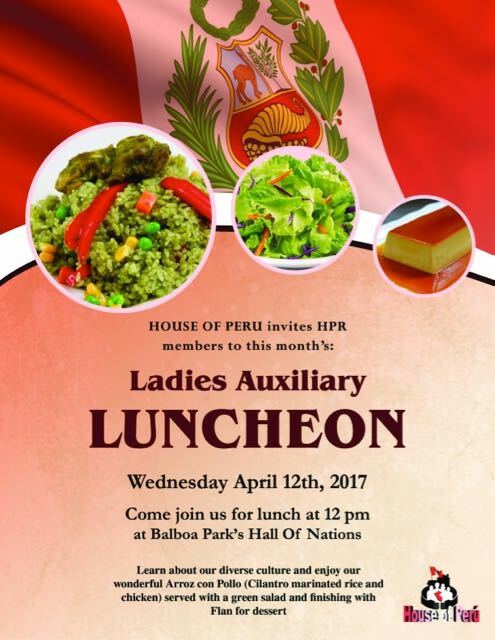 The House of Pacific Relations International Cottages Ladies Auxiliary Lunches are scheduled for the second Wednesday of the month, at noon in the Hall of Nations, price $4. For further information e-mail Brigitte Gilmore or contact her by phone: (858) 487-8402. Jean Stern, Executive Director, Irvine Museum Collection at the University of California, Irvine, will speak on Monday, November 13th at 10 am on “Impressionism and California Art, 1885 to 1930″. The International Student Center at San Diego State invites the House of Pacific Relations to the annual International Peace Village on Thursday, November 16, Montezuma Hall, Aztec Student Union, 10 am – 1 pm. International Peace Village is a SDSU tradition hosted in conjunction with the annual International Education Week celebration. It is intended to promote culture and education and for individuals/country to share information about their country to the SDSU community. The Lawn Program at 2 pm on Sunday, November 19th will be a presentation about the Peace Corps. For other scheduled lawn programs, check the HPR web site. Saturday, November 25th, 2-9 pm at the Spreckels Organ Pavilion. See http://www.christmasontheprado.com/ for details. The House of France is open the first two Saturdays and Sundays of the month from noon to 5:00 p.m. and the fourth Tuesday of the month from 11:00 a.m. to 3:00p.m. Saturday openings are new this year, at the request of the City of San Diego, so this means we need more volunteers. We hope everyone is enjoying the fall, and we extend our sympathy to everyone who has suffered in this year’s hurricane season or in the Mexico earthquakes. Be among the first to taste the “Beaujolais nouveau” on Thursday, November 2nd, at 6 pm at Red Card Café, 4140 Morena Blvd, Suite A (next to the Morena Costco). Wine + food $10 for adult members of the House of France; $5 for kids ; $15 for non members. RSVP to Marion before October 12th to help with planning. We had a fun evening of cooking, eating, and socializing on Saturday September 16th in our “3 sauces” cooking demonstration. Mireille made profiterole look easy, Roselyne showed us an efficient béchamel with blanched cauliflower, and Marion demonstrated her mother’s mayonnaise, with a surprising half egg yolk trick. Mireille demonstrating her food-processor profiterole technique (with Tim as sous chef). Join us to celebrate the season, Saturday November 11th at Michele’s house starting around 5 pm. The French Cottage will prepare the turkey. Plan to bring a dish to share. More details to come. Join the group on Saturday, November 18th at Mireille’s house in Vista, for a social afternoon of preparations for December Nights. We’ll chop and caramelize onions, grate cheese, prepare sauces for crèpes, and verify the quality of our work with a meal. The work will start around 11 am. Details to come. Plan to volunteer in our food stands Friday December 1 and Saturday December 2 for December Nights in Balboa Park. We’ll have onion soup, crèpes, pastries, and libations on offer. This is our biggest fund raising event of the year, and as always, we’ll need lots of volunteers for Friday and Saturday, and also for set up and clean up. If you’re anticipating volunteering at December Nights (and we hope you are), then please make sure that you have current food handler certification. Certification is good for 3 years and can be obtained through an on-line course. Here’s a link. The French Cottage will reimburse expenses for volunteers. The HPR will also run a course closer to date of December Nights. The French adaptive surf team is hoping to raise sufficient funds to return to La Jolla for another year of international competition at the Stance International Surfing Competition World Adaptive Surf Championship. Contribute to the Kickstarter campaign to help them out (details still to be determined). If they come, we’ll plan to join them for an early morning breakfast/brunch at La Jolla Shores on their final day of competition, Sunday, December 3rd. Plan to stop by the French Cottage on Sunday, December 10th at 4 pm, toward the close of our regular hours, to help us welcome in the holiday season with a shared bûche de Noël. The Tijuana excursion originally anticipated for October 14th has been delayed to January or February, when our Tijuana-based vice president, Evelyne Trolley de Prevaux, will help coordinate a cross-border adventure—a meal in Tijuana and an insider’s view of the city. Details still be be coordinated. We’ll plan to meet at the Old Town Park and Ride to carpool across the border. Please plan to bring your passport. Camille, born September 19th at 7lbs 14 oz, is the new daughter of John and Hannah and 7th grandchild of long-time members Mireille and Robby Santos. Everybody is very happy and doing well. We’re still in need of volunteers for Sunday, October 8th. Please see below for the open dates, and sign to host up via the SignUpGenius web link or by e-mailing Roselyne (fullyfrench@gmail.com) and/or Isabelle (isalf@earthlink.net). Nous espérons que vous passez tous un automne agréable, et nous envoyons nos condoléances à ceux qui ont eté victime des ouragans et du tremblement de terre au Mexique. Venez fêter le Beaujolais nouveau le 2 novembre à 18h au Red Card Cafe, 4140 Morena Blvd, Suite A (à coté du Costco sur Morena). Vin + nourriture $10 pour les membres adultes du cottage; $5 pour les enfants ; $15 pour les non-membres RSVP à Marion avant le 12 octobre pour l’aider à organiser la fête. Nous avons passé une bonne soirée le 16 septembre avec cuisine, repas et conversation. Pendant la démonstartion des “3 sauces”, Mireille nous a éblouis avec ses profiteroles faciles, Roselyne a montré une sauce béchamel efficace pour gratiner du chou fleur, et Marion a préparé la mayonnaise de sa mère (l’astuce consiste à commencer avec 1/2 jaune d’oeuf). Marion émulsifie la mayonnaise, avec l’assistance de Chandra. Rejoignez nous le samedi 11 novembre chez Michele à partir d’environ 17 h pour fêter Thanksgiving. Le Cottage préparera la dinde. Pensez à apporter un plat à partager. Plus de détails à venir. Rejoignez le groupe le samedi 18 novembre chez Mireille à Vista, pour une après-midi sociale de préparatifs pour December Nights. Nous hacherons et caraméliserons les oignons, raperons du fromage, préparerons des sauces pour les crèpes, et verifierons la qualité de notre travail avec un repas. Le travail commencers vers 11 h. Détails à venir. Prévoyez de nous aider à nos stands de nourriture le vendredi 1er et samedi 2 décembre pendant December Nights à Balboa Park. Nous vendrons de la soupe à l’oignon, des crèpes, des pâtisseries et des boissons. C’est notre plus grande venue annuelle, et comme toujours nous aurons besoin de beaucoup de volontaires vendredi et samedi, ainsi que pour la mise en place et le nettoyage. Si vous pensez aider pendant December Nights (et nous l’espérons bien), alors veuillez SVP vous assurer que votre certificat de service alimentaire est à jour. Le certificat est valide pendant 3 and et peut être obtenu par un cours en ligne. Voici un lien. Le Cottage remboursera les frais des volontaires. La HPR organisera aussi un cours plus près de la date de December Nights. L’équipe française de surf handi espère recueiller suffisement de fonds pour revenir à La Jolla pour une autre année de compétition internationale au Stance International Surfing Competition World Adaptive Surf Championship. Vous pouvez contribuer à leur campagne Kickstarter pour les aider (les détails restent à déterminer). Si l’équipe vient, nous comptons rejoindre ses membres pour un petit déjeuner/brunch à La Jolla Shores le dernier jour de la compétition le dimanche 3 décembre. Pensez passer au French Cottage le dimanche 10 décembre à 16h, vers la fin de nos heures normales, pour partager de la bûche de Noël. Nous annonçons la naissance de Camille, nouvelle fille de John et de Hannah, et 7ème petit enfant de Mireille et Robby, 19 septembre 7lbs 14 oz. Tout le monde se porte très bien. Nous avons toujours besoin de volontaires pour ouvrir le cottage le dimanche 8 octobre. Veuillez-voir ci-dessous et vous inscrire au lien SignUpGenius ou en envoyant un message à Roselyne (fullyfrench@gmail.com) et/out à Isabelle (isalf@earthlink.net). The French film, The Unknown Girl, is playing at the Digital Gym Cinema, from Friday September 29 to Thursday October 5. The film, starring Oscar nominee Adèle Haenel and Olivier Bonnaud, is an emotional French drama about a woman who gets obsessed with the case of a dead woman after learning that the woman had died shortly after having rung her door for help. House of France members receive a “special deal” of $2.50 off the general admission price. Use promo code “DGCCP” during the checkout process when purchasing tickets online. If buying in person at the box office, make sure to mention House of France in order to receive this special discount. Eugenie King, House of Norway, will teach a free Food Handler course in October. You can also obtain a food handler card on-line. The card is essential if you hope to help serve food at any of our events for the general public, since the City of San Diego is concerned about preventing food-borne illness. The October lunch will be hosted by the House of the England at noon on Wednesday, October 11th. 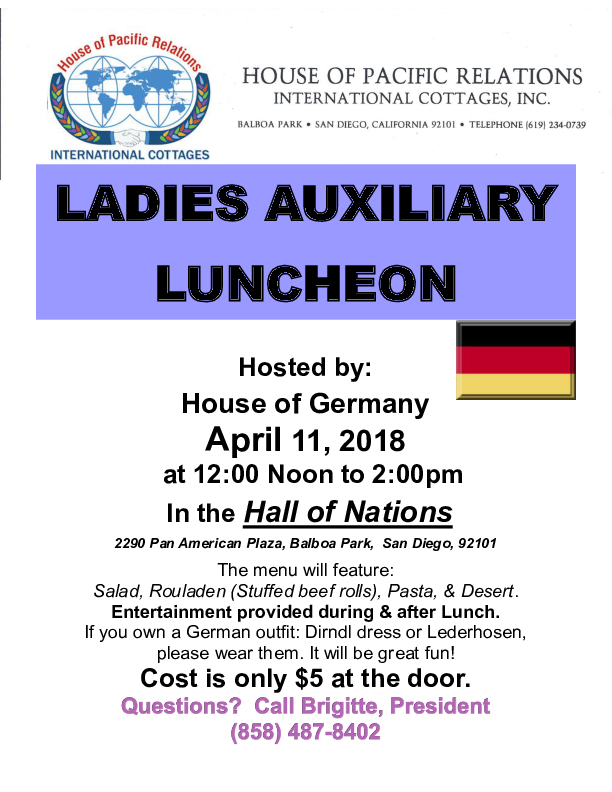 The House of Pacific Relations International Cottages Ladies Auxiliary Lunches are scheduled for the second Wednesday of the month, at noon in the Hall of Nations, price $4. For further information e-mail Brigitte Gilmore or contact her by phone: (858) 487-8402. For summer and early fall 2017, volunteers are needed for the following dates: October 8 and November 12. Even for dates with identified volunteers, additional helpers would be much appreciated for most opening dates. HOUSE OF FRANCE BONNE RENTREE ! Hope you enjoyed the summer holidays. Welcome back. Join us at 5 pm on Saturday September 16th for a lesson to hone your skills on 3 classic French sauces (mayonnaise, sauce béchamel, and crème anglaise) and an accompanying feast (mayonnaise with shrimp and vegetables; béchamel gratinated with cauliflower or as macaroni and cheese [plus a green salad]; and the classic dessert of floating island). We’ll meet at Marion Lanier’s house, 2738 Palomino Circle, La Jolla. Bring the whole family. RSVP to Marion by September 12th. In mid-October (tentatively Saturday October 14th), we’re hoping to join our Tijuana-based vice president, Evelyne Trolley de Prevaux, for a cross-border adventure—a meal in Tijuana and an insider’s view of the city. Details still be be coordinated. We’ll plan to meet at the Old Town Park and Ride to carpool across the border. Please be sure to bring your passport. Rejoignez-nous à 17 h le samedi 16 septembre pour une leçon qui affûtera vos talents de saucier avec 3 sauces classiques françaises (mayonnaise, sauce béchamel, et crème anglaise) et un festin en accompagnement (mayonnaise avec crevettes et légumes; béchamel gratinée au chou fleur ou gratin de macaroni [plus une salade verte]; et le dessert classique, l’île flottante). Nous nous rencontrerons chez Marion Lanier: 2738 Palomino Circle, La Jolla. Venez avec toute la famille. RSVP à Marion avant le 12 septembre. En mi-octobre (a priori le samedi 14 octobre), nous espérons rejoindre notre vice présidente Evelyne Trolley de Prevaux, installée à Tijaunaa, pour une aventure transfrontaliére: un repas à Tijuana and une vue d’initié de la ville. Les détails restent à coordonner. Nous nous rencontrerons au Old Town Park and Ride pour traverser la frontière en groupe. Apportez vos passeports. L’équipe française de surf adaptif espère recueiller suffisement de fonds pour revenir à La Jolla pour une autre année de compétition internationale au Stance International Surfing Competition World Adaptive Surf Championship. Vous pouvez contribuer à leur campagne Kickstarter pour les aider (les détails restent à déterminer). Si l’équipe vient, nous comptons rejoindre ses membres pour un petit déjeuner/brunch à La Jolla Shores le dernier jour de la compétition le dimanche 3 décembre. The September lunch will be hosted by the House of the Philippines at noon on Wednesday, Sepember 13th. The House of Pacific Relations International Cottages Ladies Auxiliary Lunches are scheduled for the second Wednesday of the month, at noon in the Hall of Nations, price $4. For further information e-mail Brigitte Gilmore or contact her by phone: (858) 487-8402. Girls interested in representing the House of France within the HPR Queens Organization in 2017-2018 need to apply be September 3rd. Contact Laurent Pamentuan (House of the Philippines) president of the HPR queens for 2017-18, for further information. Queens must be between the ages of 14 and 19 years old. Princesses must be between the ages of 14 and 19 years old. Junior princesses must be between the ages of 10 and 13 years old. Peewee princesses must be between the ages of 8 and 9 years old. The queens members must be these ages by October 1st of this year, 2016. Time commitment and the kind of activities: a meeting every 2nd and 4th Sunday of the month at 10 am in the Hall of Nations. around 1-2 community service events a month that vary in time and take place on the weekends. The French film After Love will screen at the nonprofit Media Arts Center – Digital Gym Cinema in North Park from Friday, September 1st to Thursday, September 7th. The film stars Oscar nominee Bérénice Bejo (The Artist) and Cédric Kahn, is an emotional French drama about a couple who decides to divorce after 15 years of marriage but must remain living together under the same roof for financial reasons. Discount of $2.50 per ticket to House of France members. Use promo code “DGCCP” during the checkout process when purchasing tickets online. If buying in person at the box office, make sure to mention House of France in order to receive this special discount. The House of Pacific Relations schedule for Sunday afternoon Lawn Programs is in full swing. To see this year’s schedule, consult the web site. The next HPR movie night will take place at 7:30 pm on Friday September 1st in the Hall of Nations. Film to be determined. Movie nights are planned as recurring events. The House of Germany will host an HPR social on Saturday, September 16th at 5:30 PM. Barbeques and a professional chef will be on hand to prepare any meat dish you may bring. Bastille Day Lawn Program, Sunday, July 9th, 2 pm. 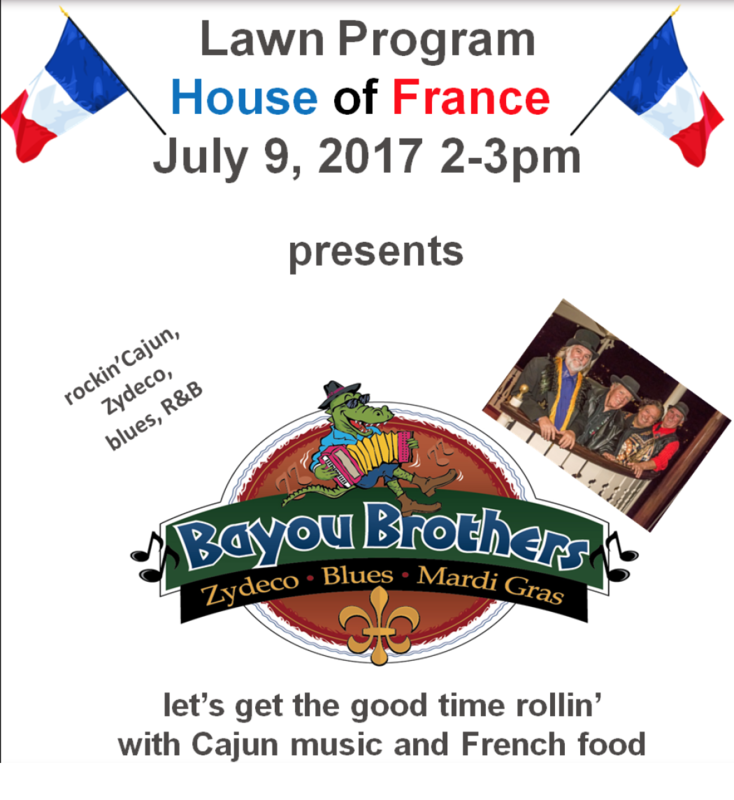 We’ve booked a Zydeco band, the Bayou Brothers, who play Cajun and Creole music. Monique Caron will open the program with US and French national anthems. Bring a blanket and plan to come listen. In honor of the event, all afternoon the House of France will have French food on offer (with a donation suggested). Donations are also gratefully accepted to help defray the costs of bringing the Bayou Brothers to Balboa Park. Donations can be made via the PayPal link on our membership page. The House of France is an IRS 501(C)3 organization, and donations are tax deductible to the extent allowed by law. Would anyone like to open the Cottage on Monday July 3rd or Tuesday July 4th? There are likely to be lots of visitors in Balboa Park over the holiday weekend. Contact Roselyne or Marion to coordinate. The city of San Diego has asked the houses to open Saturdays AND Sundays noon-5pm starting now. That means that we need more volunteers to host. Please see below for the open dates, and sign to host up via the SignUpGenius web link or by e-mailing Roselyne (fullyfrench@gmail.com) and/or Isabelle (isalf@earthlink.net). Fête de la Musique, Wednesday, June 21st, 5-8 pm. Vincent Michel organized a program of world music to coincide with the French tradition of sharing music in the streets on the summer solstice. Once again, we remind you that if you haven’t already done so, please renew your membership for the 2017 calendar year. The membership form is downloadable here and can be mailed to our treasurer Chandra Bordes, or now you can make your payment via PayPal, using the link on our membership page. (For PayPal payments please also e-mail the membership form to Chandra Bordes.) Thanks to Chandra, Roselyne, and Vincent for setting this up. Lawn Program du 14 juillet (en fait le 9), le dimanche 9 juillet à 14 h. Nous avons réservé un groupe Zydeco, les Bayou Brothers. qui joue de la musique créole et cajun. Monique Caron ouvrira le programme avec les hymnes nationaux des États-Unis et de la France. Apportez une couverture et venez écouter. En honneur du programme, la Maison de la France servira de la nourriture française pendant toute l’après-midi (avec un don suggéré). Les dons sont aussi acceptés avec reconnaissance pour défrayer les coûts d’accueillir les Bayou Brothers à Balboa Park. Les dons peuvent être effectués avec le lien PayPal sur notre page d’adhésion. La Maison de France est une organisation de l’IRS 501 (C) 3, et les dons peuvent étre déduits de vos impôts dans la mesure permise par la loi. Quelqu’un désire ouvrir le ottage le lundi 3 ou mardi 4 juillet? Il y aura probablement beaucoup de visiteurs à Balboa Park pendant le pont de la fête nationale. Veuillez contacter Roselyne ou Marion pour coordonner. La ville de San Diego a demandé aux cottages d’ouvrir les samedis ET les dimanches de midi à 17h à partir de maintenant. Nous aurons donc besoin de plus de volontaires. Veuillez voir les dates ouvertes ci-dessous et vous inscrire avec le lien web SignUpGenius web link ou en contactant Roselyne (fullyfrench@gmail.com) et/ou Isabelle (isalf@earthlink.net). Fête de la Musique, le 21 juin de 17 à 20 h. Vincent Michel a organisé une soirée de musique pour participer à la tradition française de partager de la musique en plein air et dans les rues pour marquer le solstice d’été. Une fois de plus nous vous rappelons de renouveler votre cotistaion pour l’année 2017. Le formulaire est disponible ici et est à envoyer à Chandra Bordes, ou bien vous pouvez maintenant payer avec PayPal, en utilisant le lien sur notre page d’adhésion. (Pour les paiements PayPal, veuillez SVP aussi envoyer le formulaire à Chandra Bordes.) Merci à Chandra, Roselyne, et Vincent d’avoir organisé cette possibilité. The next HPR movie night will take place at 7 pm on Friday July 21st on the “Lawn Program” lawn. Movie nights are planned as recurring events on the 3rd Friday of the month. Donations accepted to fund the shade to be built above the stage. Roselyne Gadet will run 4 week-long sessions of half-day camp in Summer 2017, for elementary-school aged children. Fees are $165/week for non-members and $125/week for House of France members. Contact Roselyne (fullyfrench@gmail.com) to enroll. For summer and early fall 2017, volunteers are needed for the following dates: July 3 & 4, July 8 & 9, August 13, September 9, 10, & 30, October 7 & 8. In addition, the San Diego Youth Symphony has a series of concerts on Tuesday, July 25th, so we are encouraged to open the cottage that day. Even for dates with identified volunteers, additional helpers would be much appreciated for most opening dates. Food can be sold twice a year, but there are three possible dates: December Nights, the Ethnic Food Fair, and the Lawn Program. We will not formally sell food for our July 9th Lawn Program but will be permitted to specify a “Suggested donation”. Ethnic Food Fair, Sunday May 28th, 10am-5pm. Entertainment on the lawn from 12 noon-4pm. The House of France will be selling quiche and pastries, and as always, we’ll need enthusiastic volunteers and enthusiastic diners. Fête de la Musique, Wednesday, June 21st, 5-8 pm. Celebrate the Solstice in Balboa Park with an evening of music, organized by Vincent Michel. Plan to bring a picnic, or purchase food from OLaLa Creperie’s stall. We met on Saturday April 29th for a relaxed spring barbecue, featuring merguez and gigot, plus baguette, cheese, desserts, and potluck contributions from members. It was a lovely afternoon at Crown Point, and the younger generation took advantage of the afternoon to kayak on Mission Bay. The eighth grade at San Diego French-American School thanks the French Cottage for donating nutella sauce leftover from December Nights. It has been transformed into dozens of nutella cupcakes for their weekly bake sale to raise funds for the class trip to Montréal. Once again, we remind you that if you haven’t already done so, please renew your membership for the 2017 calendar year. The membership form is downloadable here and can be mailed to our treasurer Chandra Bordes. Ethnic Food Fair, le dimanche 28 mai de 10 à 17 h. Programme sur la pelouse de midi à 16 h. La Maison de la France vendra des quiches et des pâtisseries, et comme toujours nous aurons besoin de volontaires et de clients pleins d’enthousiasme. Fête de la Musique, le 21 juin de 17 à 20 h. Fêtez le solstice à Balboa Park avec une soirée de musique organisée par Vincent Michel. Apportez un pique-nique, ou achetez quelque chose à manger au stand d’OLaLa Creperie. Lawn Program du 14 juillet (en fait le 9), le dimanche 9 juillet à 14 h. Nous avons réservé un groupe Zydeco, les Bayou Brothers. qui joue de la musique créole et cajun. Apportez une couverture et venez écouter. En honneur du programme, la Maison de la France vendra des pâtisseries et de la quiche du French Gourmet pendant toute l’après-midi (avec un don suggéré). Les membres du Cottage se sont réunis le samedi 29 avril pour un barbeque du printemps décontracté, avec merguez et gigot, plus baguette, fromage, desserts et autres conributions des membres. La jeune génération a profité d’une après-midi ensoleillée à Crown Point pour faire du kayak sur Mission Bay. Les élèves de 4ème (eighth grade) à l’École Franco-Américaine de San Diego (SDFAS) remercient le Cottage pour le don de la Nutella qui restait après December Nights. Celle-ci a été transformée en douzaines de gâteaux à la nutella pour leur vente hebdomadaire de pâtisserie qui recueille des fonds pour le voyage de classe à Montréal. Veuillez s’il vous plaît renouveler votre cotisation pour l’année civile 2017. Le formulaire est disponible ici et est à envoyer à Chandra Bordes. Now that winter is over, the House of Pacific Relations schedule for Sunday afternoon Lawn Programs is in full swing. To see this year’s schedule, consult the web site. 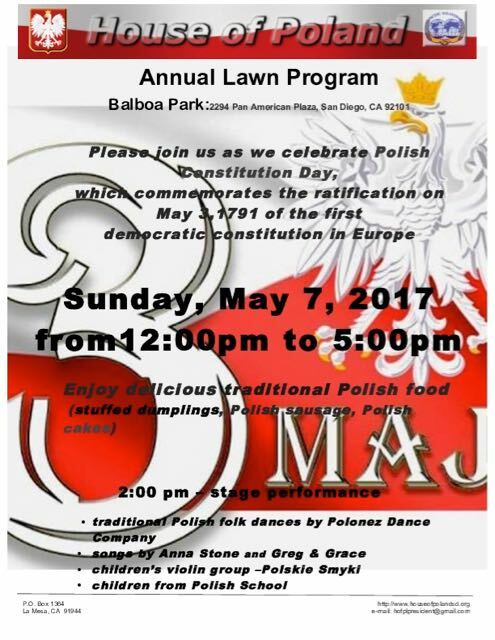 The House of Poland asked us to publicize their program on May 7th. 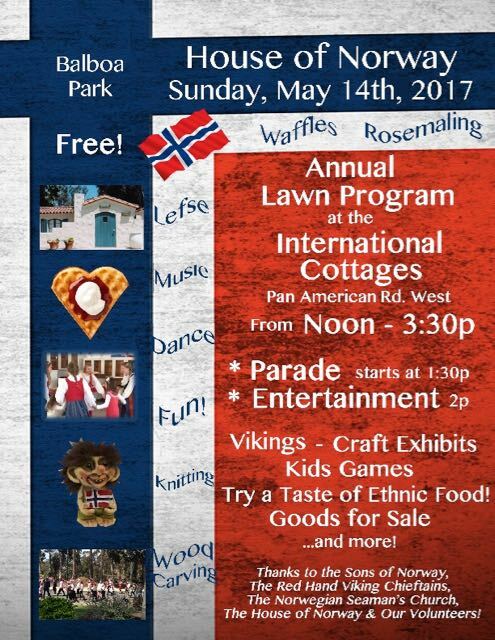 And the House of Norway asked us to publicize their May 14th program. Teachers from the San Diego French-American School are coordinating a paired event: a lecture (on immigration in France) for adults and storytime for children, both at 2 pm on Saturday May 27 at the La Jolla Riford Library. The children’s story time will meet in the children’s section of the library, and the adult discussion will be in the community room. Construction on new House of Pacific Relations cottages in Balboa Park is scheduled to begin in May. Nest DMC, a New York-based “destination management company” wrote to us seeking French-speaking tour leaders/guides for the San Diego area “to assist our groups on-site in addition to providing tours, fulfilling duties such as airport meet & greets and badge pickups for conventions.” If you feel you might be interested in working with them, please contact Victoria Copans: victoria.copans@nestdmc.com. All of us need to take responsibility for opening the French Cottage at least once per year. During the academic year, undergraduate French students from the University of San Diego, are available to help the volunteers who open the cottage but their professor, our long-time member Shirley Saad, is not available every week. Shirley’s students can cover May 7, though they might benefit from your help. For the first half of 2017, volunteers are needed for the following dates: May 28 (for the Ethnic Food Fair), June 3, June 24 & 25, July 1, July 8 & 9. Additional helpers would be much appreciated for most opening dates. Food can be sold twice a year, but there are three possible dates: December Nights, the Ethnic Food Fair, and the Lawn Program. We will not formally sell food for the Lawn Program but will be permitted to specify a “Suggested donation”. Tim Gross (Marion’s husband) has installed a new lockbox at the Cottage, so the key is readily accessible. Contact Roselyne or Isabelle if you are volunteering and need the code. And if you have a key, please return them to Roselyne or Isabelle. Happy April! No fooling! We remind you to watch out for “poisson” attempts. Spring Barbecue. Saturday, April 29th, at noon, join us for a spring barbecue at Crown Point. The French Cottage will provide merguez, baguettes, cheese, and dessert. Please bring a salad or vegetable side dish to share. RSVP to Marion (m.lanier at earthlink.net) by April 19th, so that we can order enough merguez. Crown Point is the city park on the north side of Mission Bay. Bring along bathing suits, bicycles, frisbees, a soccer ball, etc., depending on your predilections. Fête de la Musique, June 21st. Celebrate the Solstice in Balboa Park with an evening of music, organized by Vincent Michel. Bastille Day Lawn Program, Sunday, July 9th. Plan to come listen for an hour or two. The House of France will be selling pastries and quiche in honor of the event. Please forward your suggestions for performers who can share French language and culture. The city of San Diego has asked the houses to open Saturdays AND Sundays noon-5pm starting now. That means that we need more volunteers to host. Please see below for the open dates, and sign to host up via the SignUpGenius web link or by e-mailing Roselyne (fullyfrench at gmail.com) and/or Isabelle (isalf at earthlink.net). Do you have a key to the French Cottage? Our host coordinators, Roselyne and Isabelle, are working on locating all of the keys. Please contact Roselyne if you have a key, so that we can get a count and so that we can collect keys from people who don’t need them at the moment. WHAT DO YOU VALUE ABOUT THE HOUSE OF FRANCE? The House of France is always happy to welcome new members. With the City of San Diego’s new request that we open on Saturdays and Sundays in the summer, having of enthusiastic members is more important than ever. We’d welcome your thoughts on member recruitment. How should we publicize membership? What activities should we offer? And what’s special to you about the House of France? Send your thoughts to house.of.france.secretary at gmail.com, and we’ll collate ideas to put together a new membership flyer. And please encourage your French and Francophone and Francophile friends to join us. Members had a slightly belated Mardi Gras celebration on Saturday, March 4, with crêpes and onion soup on the menu. We were able to use the Hall of Nations, which had enough space for 3 long tables and lots of conviviality. You might remember that in the March Bulletin, we noted that Shirley Saad and her University of San Diego French students had hosted 26 Syrian refugee children, aged 8-12, at the House of France. The children learned French songs and games and were treated to some French pastries. After talking with the organizer, the House of France realized that one of their most urgent needs was shoes. Kids grow so fast. The House of France donated $500, which paid for 40 pairs of shoes. Diana Bashur, the coordinator, sent a thank you note, along with a photo of all the shoes. If you haven’t already done so, please renew your membership for the 2017 calendar year. The membership form is downloadable here and can be mailed to our treasurer Chandra Bordes. Bienvenue tous au mois d’avril! Attention aux poissons. Barbecue du printemps. Le samedi 29 avril à midi, rejoignez-nous pour un barbecue printanier à Crown Point. Le Cottage fournira merguez, baguettes, fromage et dessert. Veuillez apporter une salade ou un plat à base de légumes à partager. RSVP à Marion (m.lanier at earthlink.net) avant le 19 avril pour que nous puissions commander assez de merguez. Crown Point est le parc du côté nord de Mission Bay. Apportez maillots, vélos, frisbees, ballont de football, etc… selon vos goûts. Ethnic Food Fair, le dimanche 28 mai de 10 à 17 h. La Maison de la France vendra des quiches et des patisseries, et comme toujours nous aurons besoin de volontaires et de clients pleins d’enthousiasme. Fête de la Musique, le 21 juin. Fêtez le solstice à Balboa Park avec une soirée de musique organisée par Vincent Michel. Lawn Program du 14 juillet (en fait le 9), le dimanche 9 juillet. Venez écouter pendant quelques heures. La Maison de la France vendra des pâtisseries et de la quiche. Veuillez nous envoyer vos idées d’artistes qui peuvent partager le français et la culture française. La ville de San Diego a demandé aux cottages d’ouvrir les samedis ET les dimanches de midi à 17h à partir de maintenant. Nous aurons donc besoin de plus de volontaires. Veuillez voir les dates ouvertes ci-dessous et vous inscrire avec le lien web SignUpGenius web link ou en contactant Roselyne (fullyfrench at gmail.com) et/ou Isabelle (isalf at earthlink.net). Le premier samedi du mois, rejoignez Roselyne au Cottage pendant les heures normales d’ouverture (de midi à 17h) pour de la conversation et des jeux en français. Pratiquez votre français et partagez un moment ludique. Tous les niveaux de français sont bienvenus. Avez-vous une des clefs du Cottage? Nos coordinatrices Roselyne and Isabelle sont à la recherce de toutes les clefs. Veuillez contacter Roselyne si vous en avez une, pour que nous puissions vérifier que le compte est bon et ramasser les clefs dont vous n’avez pas besoin en ce moment. QUE REPRÉSENTE LA MAISON DE LA FRANCE D’IMPORTANT POUR VOUS? La Maison de la France est toujours ravie d’accueillir de nouveaux membres. Depuis que la ville de San Diego nous demande d’ouvrir les samedis et dimanches pendant l’été, nous avons encore plus besoin de membres entousiastes. Nous aimerions savoir vos pensées sur la meilleure façon d’avoir plus de membres? Comment faire savoir aux gens nos activités? Quelles activités offrir? Pour vous, qu’a la Maison de la France de spécial? Enovoyez-nous vos pensées à house.of.france.secretary at gmail.com, et nous rassemblerons vos idées pour créer un nouveau fascicule d’accueil. Et encouragez vos amis français, francophones et francophiles à se joindre à nous. Les members de la Maison de la France ont fêté Mardi Gras (un peu en retard) le samedi 4 mars avec des crêpes et de la soupe à l’oignon. Nous avons pu utiliser le Hall of Nations, qui avait assez de place pour 3 longues tables et beaucoup de convivialité. Vous vous souviendrez peut-être que dans le bulletin de mars nous avion noté que Shirley Saad et ses étudiants de français de l’Université de San Diego avaient accueili 26 enfants syriens réfugiés entre l’âge de 8 et 12 ans à la Maison de la France. Les enfants ont appris des chansons et des jeux français, et se sont régalés de pâtisseries françaises. Après avoir parlé à l’organisatrice, la Maison de la France s’est rendue compte qu’un de leurs besoins les plus urgents était de nouvelles chaussures. Les enfants grandissent si vite! La Maison de la France leur a donné $500, ce qui a permis d’acheter 40 paires de chaussures. 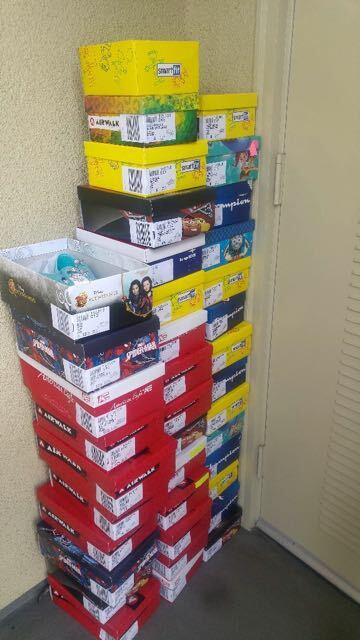 Diana Bashur, la coordinatrice, a envoyé une note de remerciements, ainsi qu’une photo de toutes les chaussures. Ben Lecomte will give presentations in San Diego on April 13th and 14th. He is a French swimmer and the first person to swim across the Atlantic. See his web site for more information on his project to swim the Pacific. Cocktail reception and presentation, Thursday April 13th, 6-8 pm, San Diego Yacht Club. 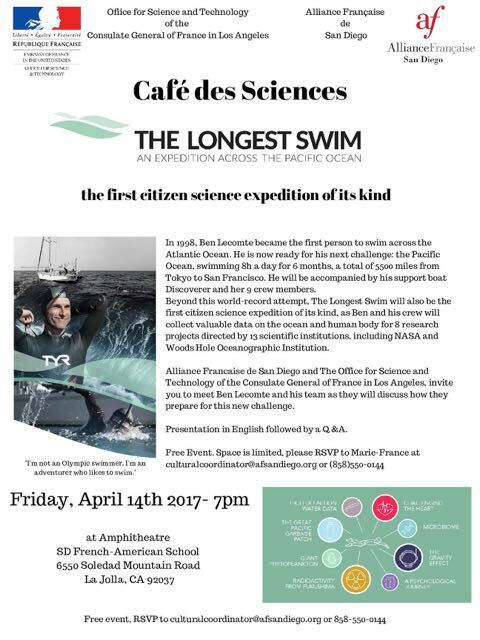 Ben Lecomte will present on The Longest Swim, and guests will have the opportunity to visit his support boat, the Discoverer. Sponsored by the San Diego French-American Chamber of Commerce. Tickets purchased until April 7th are $25 for Chamber of Commerce members, $40 for non members. After April 7th, tickets are $30 for members and $50 for nonmembers. Includes one drink plus charcuterie and cheese buffet. Café des Sciences, Friday April 14th, 7 pm, San Diego French-American School. Ben Lecomte will again speak on The Longest Swim. RSVP to cultural coordinator at afsandiego.org. The evening is sponsored by The Alliance Française de San Diego and the Office of Science and Technology of the Consulate General of France in Los Angeles. Sunday, April 23rd, 10 am-5 pm, will be the Earth Day celebration in Balboa Park. The Earth Day celebration features booths and activities for all ages. Cottages are not required to be open for Earth Day but are requested to open the preceding Saturday (April 16th). 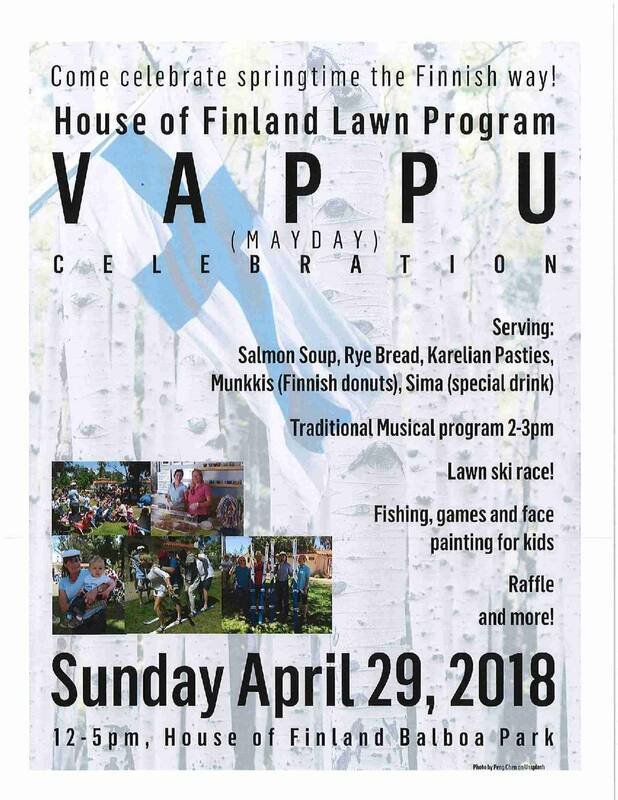 Now that winter is over, the House of Pacific Relations schedule for Sunday afternoon Lawn Programs is in full swing. To see this year’s schedule, consult the web site. The HPR Queens will do their program on April 2nd. Fees are $165/week for non-members and $125/week for House of France members. Contact Roselyne (fullyfrench at gmail.com) to enroll. Nest DMC, a New York-based “destination management company” wrote to us seeking French-speaking tour leaders/guides for the San Diego area “to assist our groups on-site in addition to providing tours, fulfilling duties such as airport meet & greets and badge pickups for conventions.” If you feel you might be interested in working with them, please contact Victoria Copans: victoria.copans at nestdmc.com. Food can be served on Saturday and Sunday and it must meet Health Department requirements, which means that individually packaged cookies or pastry can be served. Additional information on these restrictions will be forthcoming. We have said we will offer cookies (madeleines, palmiers) and bread. or contact Roselyne G. fullyfrench at gmail.com or Isabelle F. (858) 404-0755 isalfsd at gmail.com. All of us need to take responsibility for opening the French Cottage at least once per year. During the academic year, undergraduate French students from the University of San Diego, are available to help the volunteers who open the cottage but their professor, our long-time member Shirley Saad, is not available every week. Shirley’s students can cover April 9, and May 7, though they might benefit from your help. The board members welcome your suggestions. Feel free to share your ideas. Check SignUpGenius for dates to help open the cottage, participate in the July lawn program, and help with the May ethnic food fair. Thanks to everyone who came to our our onion soup and crêpes dinner. We are writing to you for few reasons. We urgently need hosts for this coming weekend (Saturday and Sunday, noon to 5pm). Food rules have changed, but if you’d like you can serve individually packaged items such as madeleines. The city is introducing new rules. From now on, anyone who serves food must have a food handler’s certificate. A food safety class and certification will be available March 23 at 6:30 pm in the Hall of Nations. There is no charge. If you want to go please contact Marion (m.lanier at earthlink.net) by March 21st so can provide a head count to the House of Pacific Relations. On March 25 from 5:30 pm until 9:00 pm in the Hall of Nations, the House of Pacific Relations hosted a gathering with music and food for all members of the House of Pacific Relations and members of all the Cottages who are in good standing. The city of San Diego has asked the houses to open Saturdays AND Sundays noon-5pm starting now. That means that we need more volunteers to host. Please see below for the open dates, and sign to host up via the SignUpGenius web link or by e-mailing Roselyne (fullyfrench at gmail.com) and /or isabelle (isalf at earthlink.net). Ethnic Food Fair, Sunday May 28th, 11am-5pm. The House of France will be selling quiche and pastries, and as always, we’ll need enthusiastic volunteers and enthusiastic diners. Fête de la Musique, June 21st. Celebrate the Solstice with an evening of music, organized by Vincent Michel. A group from the French Cottage attended a screening of Thank You For Calling on February 18th at the San Diego Jewish Film Festival. Two other French films were also screened at the Jewish Film Festival, and members and friends were able to attend at a reduced price. Please renew your membership for the 2017 calendar year. The membership form is downloadable here and can be mailed to our treasurer Chandra Bordes. La ville de San Diego a demandé aux cottages d’ouvrir les samedis ET les dimanches de midi à 17h à partir de maintenant. Nous aurons donc besoin de plus de volontaires. Veuillez voir les dates disponibles ci-dessous et vous inscrire avec le lien web SignUpGenius web link ou en contactant Roselyne (fullyfrench at gmail.com) et/ou Isabelle (isalf at earthlink.net). Ethnic Food Fair, le dimanche 28 mai de 11 à 17 h. La Maison France vendra des quiches et des patisseries, et comme toujours nous aurons besoin de volontaires et de clients pleins d’entousiasme. Fête de la Musique, le 21 juin. Fêtez le solstice avec une soirée de musique organisée par Vincent Michel. Le dimanche 12 février Shirley Saad et ses étudiants de français de l’Université de San Diego ont accueilli 26 enfants syriens réfugiés, âgés de 8 à 12 ans, à la Maison de la France. Shirley a écrit un mot en anglais (voir ci-dessus). Arab Youth Collective aimerait remercier la Maison de la France de nous avoir reçu pendant notre journée à Balboa Park! Les enfants se sont beaucoup amusés et ont eu plaisir à rencontrer le staff et bénévoles de la Maison Française! Arab Youth Collective (AYC) travaille essentiellement avec les enfants et jeunes Syriens récemment arrivés aux Etats Unis, qui pour la plupart ont été transferés de pays tiers (Turquie, Liban, Jordanie, Egypt) où ils ont pris refuge avec leurs familles. AYC a pour but de soutenir les enfants et leurs familles et de faciliter leur integration à San Diego. Pour l’instant nous organisons des activities sportives et artistiques pour les enfants ainsi qu’un cours de programmation pour les plus jeunes. Nous vous remercions encore une fois de nous avoir accueilli. Vueillez s’il vous plaît renouveler votre cotisation pour l’année civile 2017. Le formulaire est disponible ici et est à envoyer à Chandra Bordes. Teachers from the San Diego French-American School are coordinating French cultural sessions for children and adults at 2 pm on Saturday, March 18, April 8, and May 13 at the La Jolla Riford Library. The children’s story time will meet in the children’s section of the library, and the adult discussion will be in the community room. April 23rd will be the Earth Day celebration in Balboa Park. The Earth Day celebration features booths and activities for all ages. The House of France is open the first two Saturdays and Sundays of the month from noon to 5:00 p.m. and the fourth Tuesday of the month from 11:00 a.m. to 3:00p.m. Saturday openings are new this year, at the request of the City of San Diego, so this means we need more volunteers. Current rules do not allow food sampling on Saturdays. On Sundays, we have said we will offer cookies (madeleines, palmiers) and bread. Madeleines and palmiers can be found at Smart and Final at a good price. For the first half of 2017, volunteers are needed for the following dates: March 11, March 12, April 1, April 8, May 6, May 13, May 28 (for the Ethnic Food Fair), June 3, June 24 & 25, July 1, July 8 & 9. Additional helpers would be much appreciated for most opening dates. Copyright © House of France, Balboa Park, San Diego, All rights reserved. The city is introducing new rules. From now on, anyone who serves food must have a food handler’s certificate. A food safety class and certification will be available March 23 at 6:30 pm in the Hall of Nations. There is no charge. If you want to go please contact Marion (m.lanier@earthlink.net) by March 21st so can provide a head count to the House of Pacific Relations. The city of San Diego has asked the houses to open Saturdays AND Sundays noon-5pm starting now. That means that we need more volunteers to host. Please see below for the open dates, and sign to host up via the SignUpGenius web link or by e-mailing Roselyne (fullyfrench@gmail.com) and /or isabelle (isalf@earthlink.net). La ville de San Diego a demandé aux cottages d’ouvrir les samedis ET les dimanches de midi à 17h à partir de maintenant. Nous aurons donc besoin de plus de volontaires. Veuillez voir les dates disponibles ci-dessous et vous inscrire avec le lien web SignUpGenius web link ou en contactant Roselyne (fullyfrench@gmail.com) et/ou Isabelle (isalf@earthlink.net). Ethnic Food Fair on Sunday May 28th from 11AM until 5PM. le dimanche 28 mai de 11 à 17 h.All are welcome – members and the general public. Participate and Help: The city is introducing new rules. From now on, anyone who serves food must have a food handler’s certificate. A food safety class and certification was available March 23 at 6:30 pm in the Hall of Nations. All were welcome – members and the general public. Fête de la Musique on Wednesday June 21st from 5 until 8PM. Also known as ‘World Music Day’ or “Make Music Day” in America, La Fête de la Musique is a free public festival celebrating music and its arts. It takes place throughout France and the World (Santa Barbara, L.A, Tokyo, Berlin, Balboa Park and I forget some…) each year on June 21st. Coinciding with the first day of the summer, this celebration took off in 1982 with Minister of Culture Jack Lang on Jun 18, 2012 from idea or suggestion brought by American Music Consultant working for the French Ministry of Culture. All are welcome.